24/92 David Mumpower I'm told there are some homoerotics undertones to this film. They are just too subtle for me to notice, though. Now back to the scene where Stiller is slowly rubbing Wilson's shoulders. 44/55 Reagen Sulewski Just enough... enough mining the '70s already for humor. It's been done. Vince Vaughn's laid-back suburban villain is the highlight here. 44/48 Les Winan How do you not do anything funny with Snoop Dogg? Or, worse, Owen Wilson? 52/126 Kim Hollis Owen Wilson singing "Don't Give Up on Us Baby" is well worth the price of admission and then some. There really is no greater comedy pairing working together today than Ben Stiller and Owen Wilson. From tiny antagonisms in Meet the Parents to pure, Mr. Furious-inspired angry chases in The Royal Tenenbaums to dumb but hardworking male models in Zoolander, the two actors just have an ability to play off each other that is a perfect recipe for laughter. 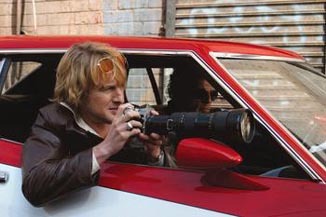 Based on past performance, it’s certainly easy to see why director Todd Phillips chose to once again pair up the duo in the theatrical adaptation of the ‘70s television show Starsky and Hutch. For the uninitiated, that show ran on ABC from 1975 to 1979 and featured Paul Michael Glaser as Starsky, David Soul as Hutch, and Antonio Fargas as Huggy Bear. They drove an at-the-time hot-looking red 1974 Ford Gran Torino, and drove around a metropolis named Bay City on the toughest crime cases. They rely on their street informer Huggy Bear to assist them in finding clues to solve their cases. In the case of this movie update, although it is also set in the ‘70s, it is much more heavy on comedy than action. With the cast involved, that only makes sense. Stiller plays the role of Dave Starsky, while Wilson plays Ken “Hutch” Hutchinson, with the inimitable Snoop Dogg as Huggy Bear. The supporting cast is terrific, with Vince Vaughn featured as the main villain (after his wicked performance in Old School, he’s an excellent choice). Other players include Carmen Electra and Amy Smart as Bay City Cheerleaders (and love interests for our two heros), Juliette Lewis (Vince Vaughn's mistress) Jason Bateman (Vince Vaughn's minion), with cameos by Chris Penn and Will Ferrell.